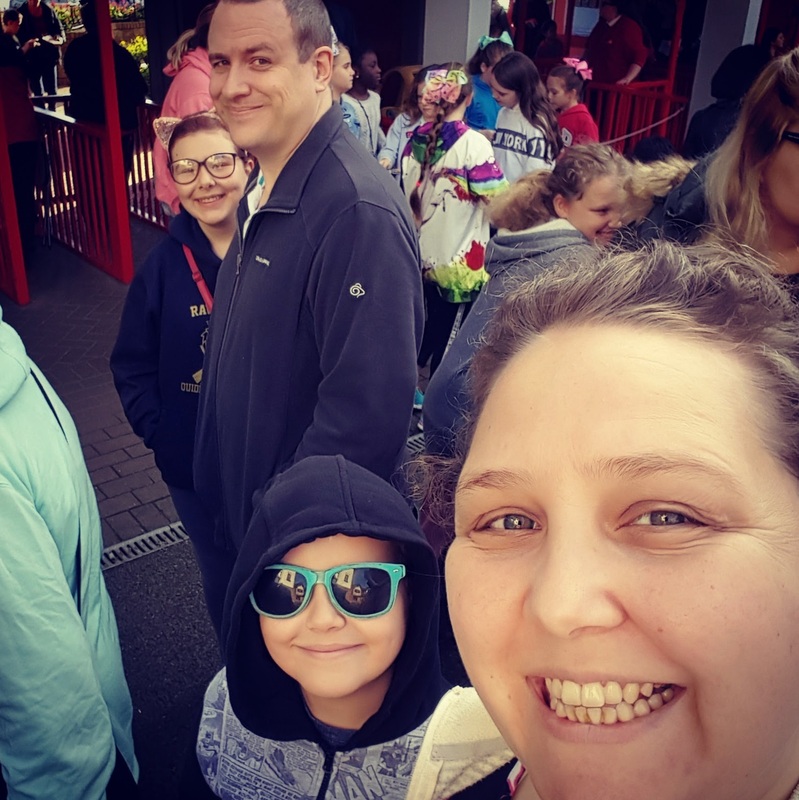 Living in Milton Keynes is fantastic fun; we have everything a family could need within easy reach of our homes, even a Theme Park aimed at Children between 2 and 13. This means that at Gulliver's Land there are rides suitable for thrill seekers or those who like it a little bit less hair-raising and a little more sedate and when we were invited to go and visit a new area that had opened at Gulliver's Land Milton Keynes dedicated to the most iconic of construction machinery companies - JCB, it was without a moment of hesitation, I agreed because I'd always had a soft spot for the yellow JCB as had Dan Jon! 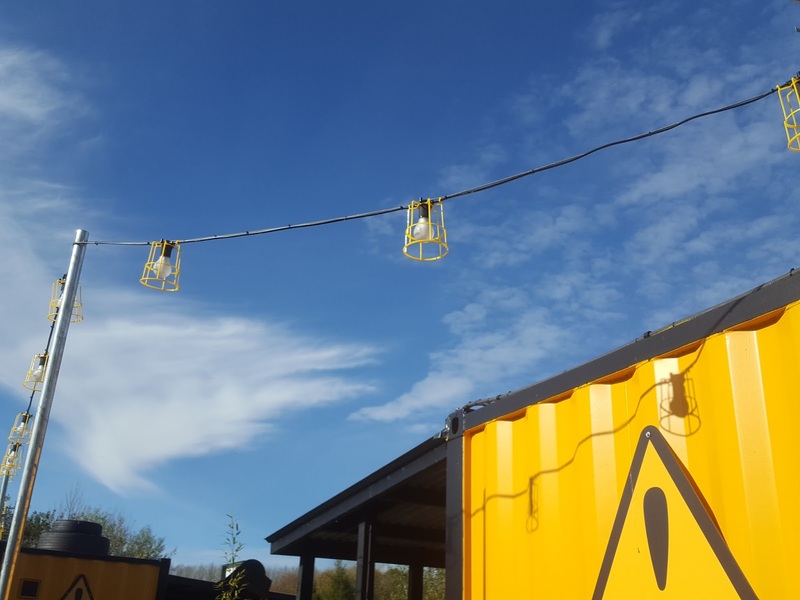 We were not disappointed, the whole area was awash with yellow and black and looks amazing. I mean I guess it kinda helped that we went on a day where the park was covered in a beautiful blue sky, but I think that the brightness of the yellow would brighten even the greyest of days. The area has some of our old favourites such as The Crazy Mouse Roller Coaster, The Mirror House, Demolish Dodgems, the Toy Factory Play Area and some new attractions that were very popular whilst we were hanging out in the area, including the Heavy Lifting Zone, Rubble Zone, Driver Zone, Construction Golf, Big Dig Zone and the Crazy Crane as pictured above. 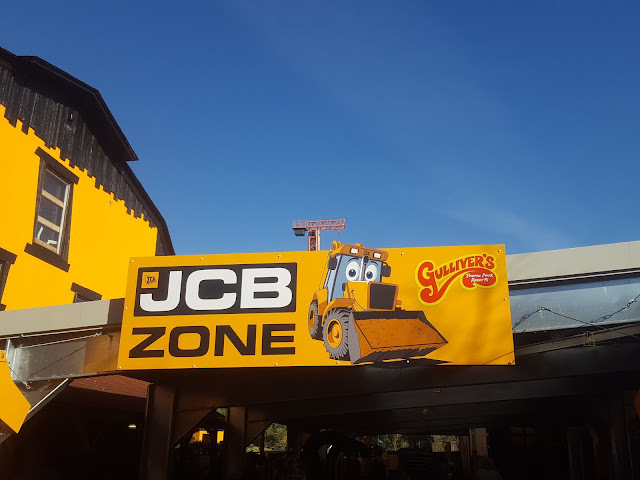 Seeing as we are totally jammy, we also managed to get a private tour of the JCB Construction Cabins at Gulliver's Land too. 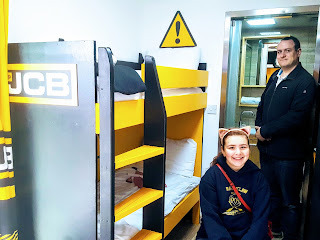 The manager who gave us the tour, told us all about the cabins and how even the staff want to move into them because of the cuteness of them, so it was good to know I wasn't alone! The cabins are honestly so well thought out, there is a lot of little detail not only in the cabin itself (A bench made out of a Mud Bucket for example) but even outside with tracks in the concrete and the cutest construction lights I've ever seen. The inside of the cabins are super cute, with the bathrooms almost being exact replicas of my new bathroom. I knew I made good choices to make the most of a little space! 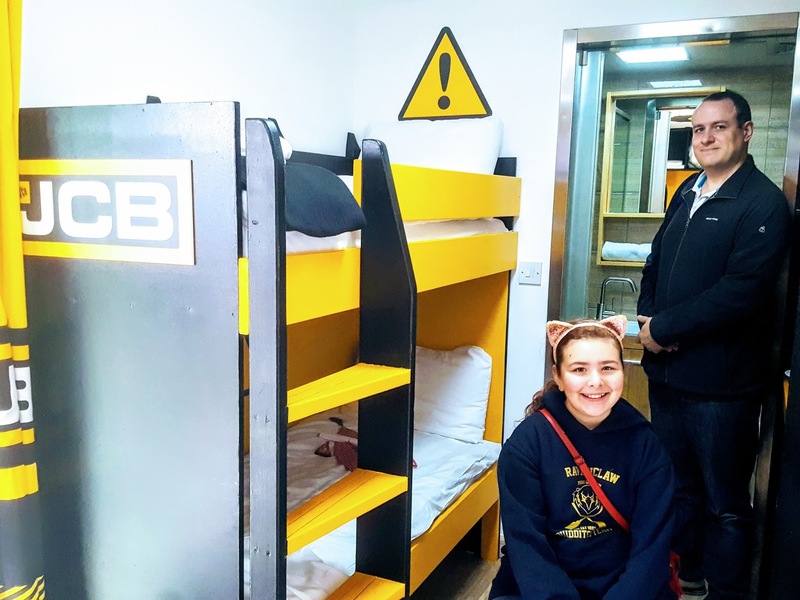 The cabins sleep four, two in bunk beds and two on a sofa bed and the outdoor area attached to each cabin would certainly come in handy come bedtime. I could imagine sitting out curled up in a blanket with a mug of something hot (with a dash of something stronger for those of you who drink!) whilst the children settle down to sleep after a long day of rushing around the park from one ride to the next. 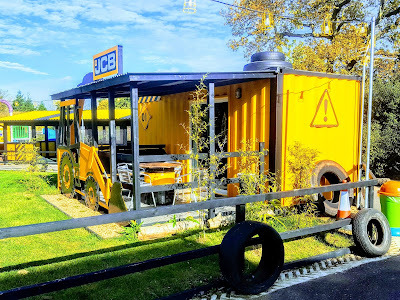 The manager also mentioned how the JCB Construction Cabins are going to be available to book over the Christmas opening period for special Santa Sleepover packages. How much fun for the family would it be to stay in one of the JCB Construction Cabins and to visit with Santa and have a day at the theme park? I think some little children (and not so little children in the form of Mums and Dads who also have an obsession with JCB) are going to have an early Christmas this year. We had an absolute blast together and I'll write another post in the next couple of days about what we got up to and include some brilliant videos as I didn't want to overwhelm you with everything in this post! Just before I do go, I think the only other thing I need to mention is that the staff at the Park were amazing fun, every single member of staff that we had the pleasure of talking to, smiling at, having our belts checked by was trying to make sure that we (and the others at the park) were having the best time that we could and I may have told the management team that if they could get me a jacket I'd happily come and work for free because everyone was so nice! 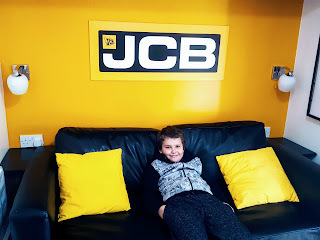 We received free tickets to the park to review the new JCB Area. DAn Jon also got some cool little goodies, including a wicked Cap which I may have stolen for me! If you want to read my disclosure policy, you can click that link but trust me I tell it like it is because I'm honest like that! Pippa, What On Earth Does *That* Mean? Faith In God - Err, What's That Then?